My husband’s birthday was a couple of weeks ago and I wanted to take him somewhere where even the kids could enjoy dinner. I decided to take him to Hard Rock Cafe in center city Philadelphia. Since my husband is a musician and author, I knew that he would enjoy being there. The service and staff were very friendly. Our waiter was very informed on what was a must try on the menu. We started with a BALSAMIC TOMATO BRUSCHETTA. It was so flavorful that my kids were wanting more. Next came time to order the main course. My husband ordered a delicious salmon platter with a mushroom sauce and steamed broccoli with a side of mashed potato. I ordered the fried shrimp platter. The shrimp were fresh and the batter was light not over breaded. It came with a side of citrus coleslaw, seasoned fries and spicy cocktail sauce. We loved every bite. The drinks were on point. we enjoyed some waboritas and watermelonRitas. The kids enjoyed their dinners too. My daughter had pasta with marinara sauce and a side of veggies and my son had chicken tenders with veggies. The last part of course is always the best… dessert. We got a big fudge brownie bowl to share and sing happy birthday to our special guy. Hard rock isn’t just about the great food and drinks but it has a great atmosphere. They have a couple different artist outfits and guitars around the restaurant. Also get entertained by music videos playing though out the place, and their gift shop is a place you must at least browse. 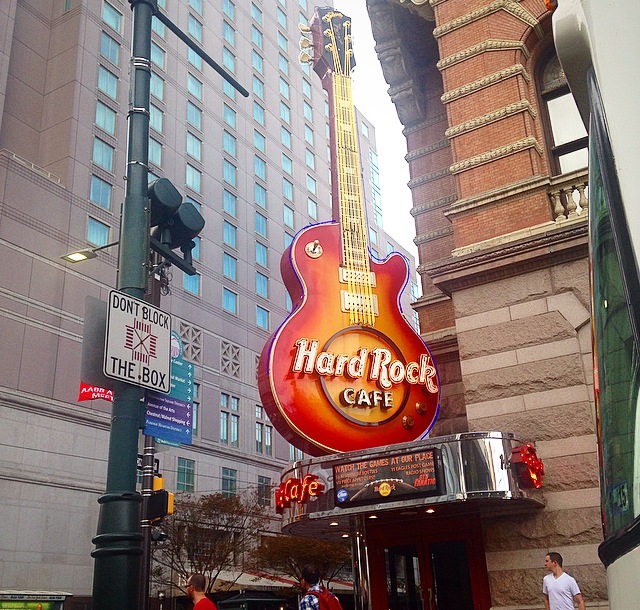 Hard Rock Philly can even host your next office/gathering party in the back room.